Posted on September 21, 2018 at 3:46 pm. After weeks of August smoke, I am one of many who is joyfully celebrating the golden sunshine, blue sky, lovely clouds and longed-for rains of this subtle September. It’s the clear air! How precious to see the lake and mountains again and to recognize what we cannot take for granted. And yet it was a delightful and special summer. We asked for help and you came – teachers and karma yogis – giving quality selfless service. And as you give, you grow ever closer. The Ashram becomes more yours because it belongs to those who truly align with the ideals, whether you are just stepping in, or returning after years away, or deepening your commitment through initiations. 2018 was our first summer with the completed Temple of Light, and our many guests, students and drop-in visitors (up to 40 a day!) expressed how it touched them. The Temple shone during our Dedication weekend, and embraced appreciative audiences during impressive concerts. We continue to watch how, like a living flower, it unfolds and attracts those hungry for its sweetness. I feel grateful for Swami Radha’s vision, which includes an openness to innovation and an adaptation to the times. It is the constant learning that helps us grow into who we can be. So as we prepare for 2019, we look forward to entering the learning edge of the unknown. Thank you for your continued support and we invite you to join us – this fall and next year! Between the ingoing and outgoing breath, there is a centre of stillness, a place of deep mystery and potential. Awaken your intuition and discover what emerges. Find ways to make this internal balance present in your life. 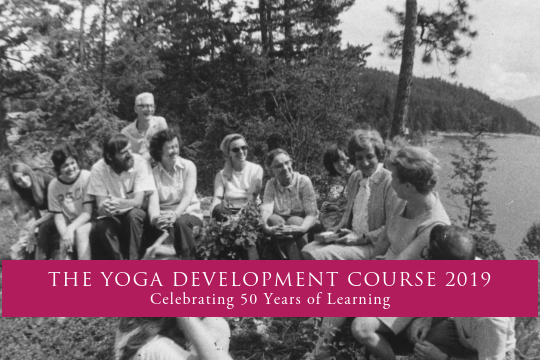 Reserve your place in the 50th anniversary of our three-month Yoga Development Course (YDC)! Give this precious gift of personal and spiritual growth to yourself. It is valuable to all those who wish to make lasting changes and to live a richer, more meaningful life. Find out more and see article below. 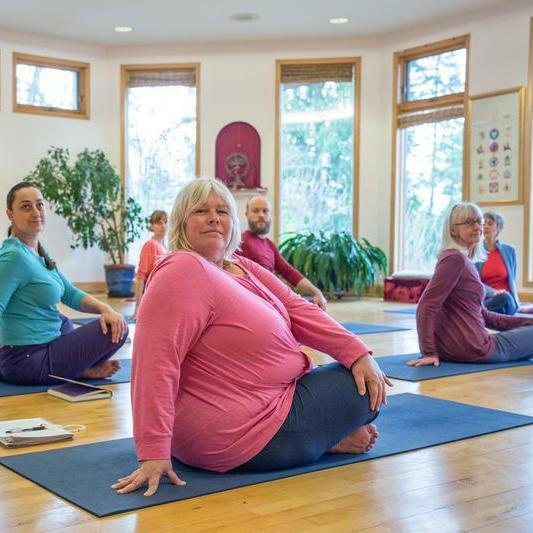 Start planning now for your 2019 learning at the Ashram! 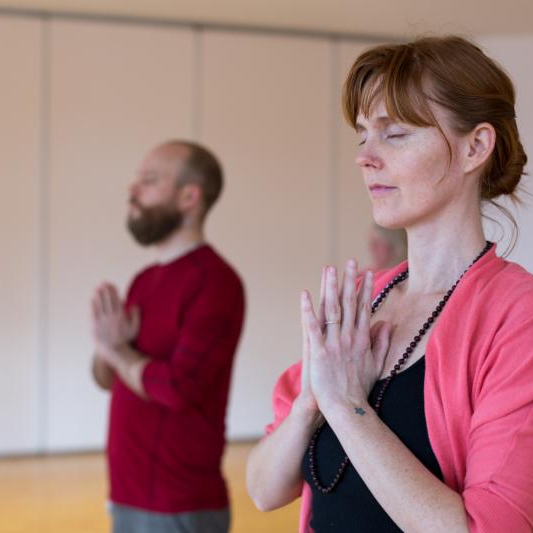 Check out our retreats, courses, Karma Yoga and other offerings in the coming year. 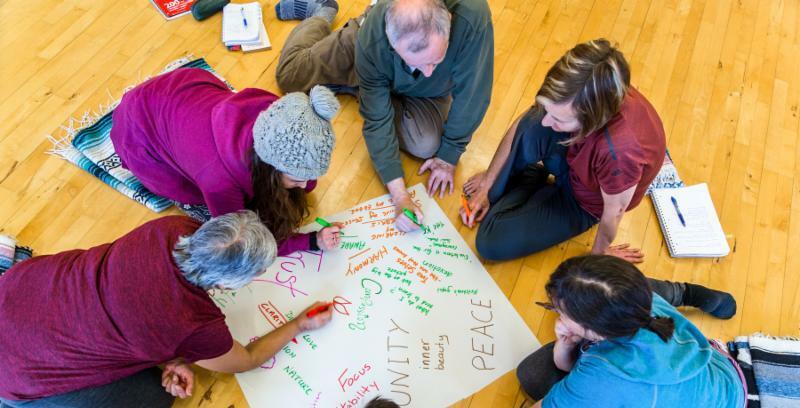 The YDC is a balance of personal self-inquiry and group work in a community of like-minded people – each on their unique path. 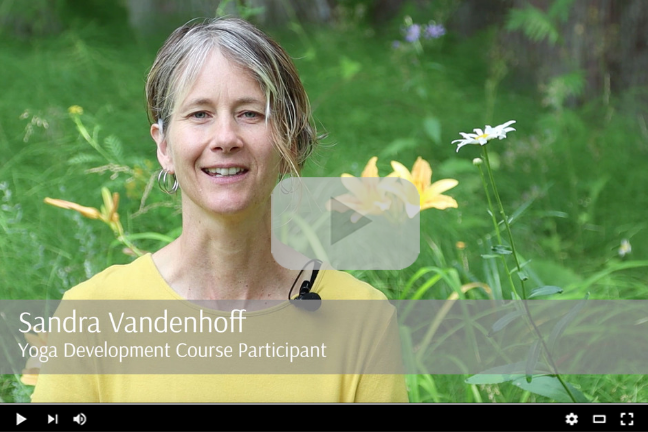 The course is transformative, giving people a new perspective that is vast and generative. This change ripples out to touch others. Join the 2019 YDC in January and immerse yourself in a process that can lead to greater freedom, self-knowledge and purposeful change. The Temple of Light holds the warm glow of mantra, devotion and clarifying vibrations following August events that drew people from our international and regional communities. In mid-August, the Temple hosted two memorable performances bridging the spectrum from experimental contemporary music to traditional Indian dance. 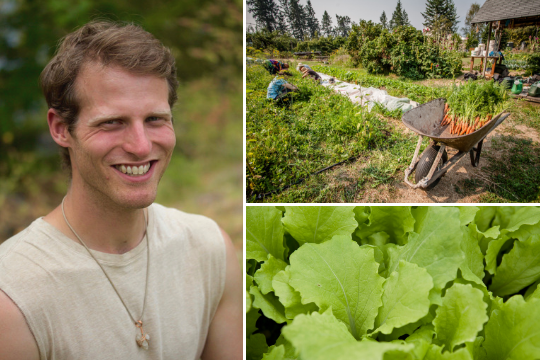 Justin Wesenberg arrived at the Ashram this spring to participate in a three-month Learning Residency to gain new skills in gardening. He found the learning environment to be “really authentic” and recommends it for young people. I chose the Learning Residency program because I was in transition and researching Transpersonal Psychology as a new career path. The Ashram was recommended as a place I could begin my studies in a less formal way, and friends encouraged me to go. I learned about serving others, which was a great experience. It gave me a greater perspective of what service means. I always reflected before, but being given reflection questions and sharing with other people made me think in a different way. I remember Swami Sivananda saying during our orientation that spiritual life requires two things – quality in action and self-awareness. The Ashram teaches both. I feel like I have a lot more awareness about what is important to me and who I am as an individual and how I can be of greater service to others. I know now I can do what my heart desires – work as a counsellor and publish my poetry. I’m returning home to help my family with their new vegetable garden with lots of new skills and knowledge. Read Justin’s poem about his experience this summer. You can support young adults in their learnings! The Ashram offers young adults a fee-free opportunity to actively participate in the community – practising selfless service, gaining skills and diving into the teachings. Make a donation today to the Education & Outreach Fund to help support our Young Adult Program. 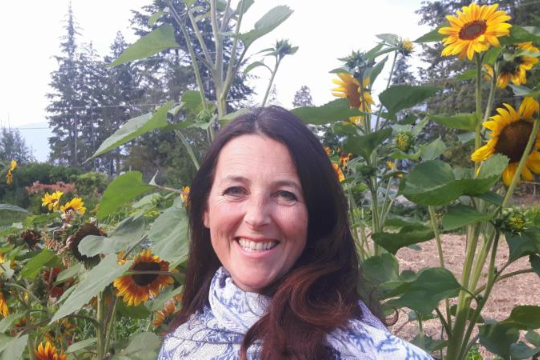 Joanne Taylor is a PhD Candidate, researcher and instructor in Community, Culture and Global Studies at UBC Okanagan. 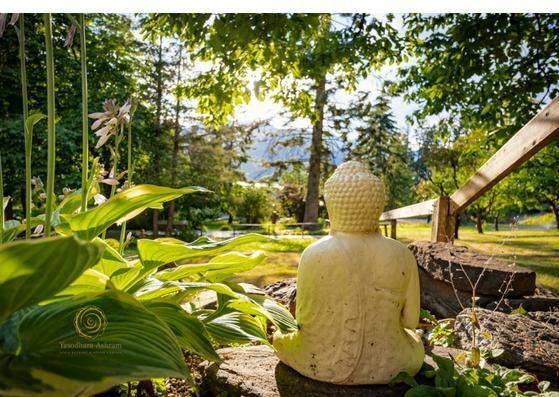 In July she came to the Ashram on a Professional Renewal Retreat to support her writing and discovered that the Ashram symbolizes the very heart of her research. I came to the Ashram at this time because I needed a place that is spiritual, peaceful – a place for deep reflective thinking. I felt a synchronicity, deeply reflective of what my research is about. 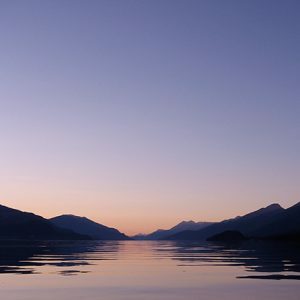 Where the Ashram is located feels like the heartbeat of the Columbia River. I am eating the food that has been grown by the waters I am studying, and I am embodying the very essence of my research. This is a respectful, compassionate and safe community. I will take away the knowledge that spirituality is a lifelong journey, and I will definitely come back to learn more lessons. 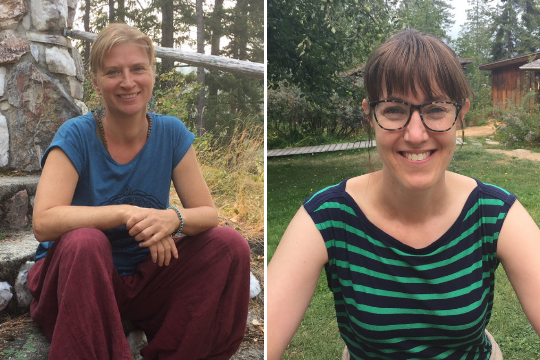 Trine Mikkelsen (left) and Julia Hambleton first came to the Ashram when they were in their twenties. Back at the Ashram this summer, they reflect about the impact that time had on their lives. Trine: When I first came here in my twenties as a photographer, wanting to do a documentary about the Ashram, I remember thinking, “Wow, what is this place?” It took awhile before I started to understand the sacredness and sweetness of what was going on. Being here gave me an insight that I had really hit upon something extremely special – a way to look at the world and how I live. I came back to take the Yoga Development Course and eventually became a teacher. Now with a business and family of my own, the Ashram and teachings seep through into everything I do – in the sense of being aware and knowing I have choice. This knowing has given me a way to navigate through life. I honestly don’t know what I did to get this gift, to find a place that is authentic and clear and in it for the long haul. It’s hard to come by – the real deal! Julia: It’s very meaningful to come back to a place where I was given a gift of support and inspiration to go forward in my life and to see twenty years later that some of my dreams and goals have been realized. Being supported and nurtured at that time in my life was pretty powerful. – family, music and community. It’s really nice coming back to the Ashram and seeing youth here, doing the same Young Adult Program I did and getting what they need. It is vital to support them in today’s world. It just seems like, Wow, I’m so glad this is here! 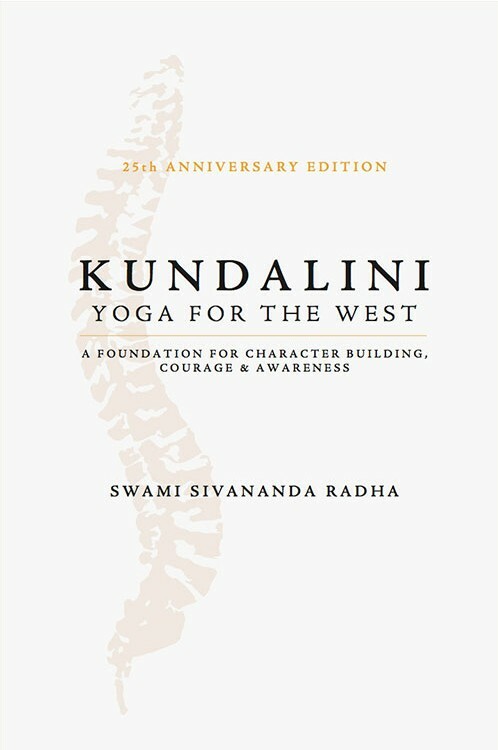 In Kundalini – Yoga for the West, Swami Sivananda Radha presents this classic yogic text as a resource for personal development, with the tools for discovering our true source of knowledge and inspiration. Using reflection exercises, meditations and breathing techniques, Swami Radha takes us step by step, chakra by chakra, through an exploration of consciousness. FireSmart at the Ashram – After another summer of wildfires and smoke in the Kootenays, we have blue skies at the Ashram again. Although we experienced smoke throughout August, there were no fires near enough to be of concern to our safety. Over the past few years, we have attended FireSmart trainings, conferences and Community Wildfire Protection Plan meetings. This year the Ashram is working with local FireSmart representatives to apply for FireSmart Canada Community Recognition. As we have done for many years, we continue to address ember traps in and around our buildings, as well as treating the forest areas to reduce fuel loads. 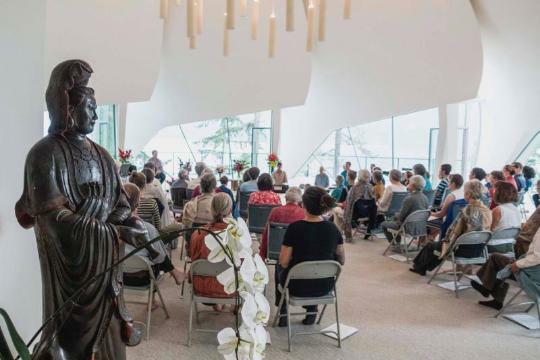 Swamis Tour with the Teachings – Swami Matananda is currently in Eastern Canada, offering workshops in Montreal, Halifax and Ottawa during September. Swami Jyotihananda heads to Calgary October 19-21, while Swami Satyananda travels to the Okanagan to offer workshops in four locations October 25-28. Swami Sukhananda has many workshops planned for her fourth European tour from mid-November to April 2019. Spread the word! Temple of Light Video – Our Temple Dedication weekend included the public release of the film Temple of Light, filmed and edited by Gem Salsberg. This short film commemorates the completion of the new Temple in 2017, three years after the original Temple burned. Interviews with residents, guests, construction workers and Patkau Architects highlight the significance of the Temple in today’s world. See this film and others on our YouTube channel.